How Much Does It Cost For a Complete Solar Panel Installation? The issue of how much it would cost to fully finance a solar power project is one of the many factors that homeowners contend with when switching to green energy. Whether the project is meant to offset your dependence on the grid or for taking over 100% of your home’s power consumption, it still calls for proper budgeting if it’s to be done to completion. That said, estimating the cost of an entire solar energy project is not as obvious as most would think. Try searching the web and you’ll notice the variation in the figures (sometimes even in thousands of dollars) given by different online “resources” and solar cost calculators. We must look at all the variables of your particular situation in order to estimate the cost of a solar panel project. Unless a company or an electrical contractor is given a comprehensive description of the job at hand, including the type of installation and amount of wattage required, they cannot give you an accurate estimate. This doesn’t imply that it is impossible to assess the cost of an upcoming solar project. It simply means that most of the generic solar cost calculators online today are inaccurate and are often less than useful. So let’s do our analysis by showing you each part of the job that is factored into calculating the total cost of a solar power project. The cost revolves around the following factors. The size is directly tied to the power capacity expected to be generated by the solar power project. On average, to operate off the grid, a home requires anything between 800 to 1500 watts of solar power in a day (this may vary depending on your power usage). However if you only need to offset part of your dependence on the grid, then this figure could be much smaller. In case you’re not sure of your daily power consumption, then the energy calculator provided at energy.gov, by the US Department of energy, could be helpful to some extent. Keep in mind that the bigger the project, the less the installation costs per unit wattage. For every watt generated, installing a 5000W solar project could sap fewer resources than setting up a 1000W project. Fortunately, over the years, solar panels have become cheaper and readily available, thanks to the technological strides we’ve taken over the last two decades. Solar panels today only cost a fraction of the marked price they once had some fifteen years ago. With an estimate of your home’s energy expenditure (mentioned earlier in this article), then working out the required number of panels becomes easier. For example; if you have to generate 1000W per day to run your home sufficiently, then you could use two 500W rated panels or five 200W panels comfortably. The duration of the overhead sunlight determines the number of panels required to furnish a given consumption. For example; if you live in an area that records up to three hours of peak sunshine, then one 500W would be enough to generate 1500W of useful energy on a cloudless day. On the other hand, someone living in the tropics where it’s possible to record six hours of peak sunshine per day, they will only need a single 200W panel to generate the same power capacity. Lastly, the estimation of the total cost of your upcoming project has to include the price of hiring an experienced and licensed professional. You also have to budget for miscellaneous costs e.g., the electrical wiring, the inverter units, the mounting hardware, and maintenance/inspection costs. Weaving in all the four factors together, the average homeowner in the United States can expect to incur anything between $7.50 to $15.50 per watt, to finance the project to completion. For most homeowners, this could easily translate to between $14,000 to $30,000 including all miscellaneous cost and before any rebates or tax incentives. 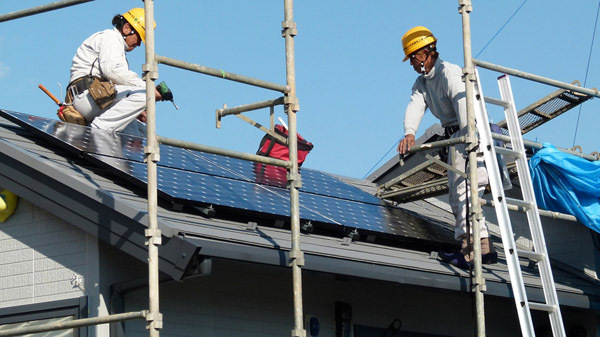 However if you cannot afford to pay the full amount right away there are many financial institutions nowadays offering special solar loans to homeowners planning on embracing this kind of renewable energy.